We have been up to quite a lot! We have been preparing for the 11 Americans coming in to put on a Kids Bible camp for this next week. Yesterday we prepared the crafts and equipment needed for the week of camp. We also got to attend the Arise Africa staff meeting. It was interesting to hear the updates on the schools and the Home while getting to know the staff better. After spending the day working on camp, we were able to relax for several hours via our hammocks! 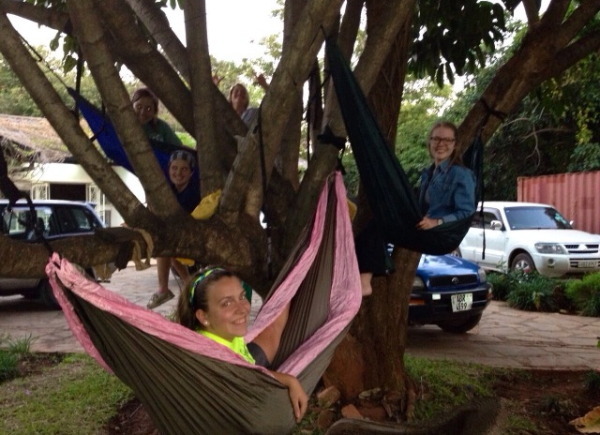 We found the perfect tree to hammock in and managed to get all of us interns in one tree. Today we went on an adventure with the Arise Home kids! We took them to the Elephant Orphanage and loved getting to know them better while crammed into one car... all 17 of us. We introduced the kids to some American music, pulled off of Morgan’s playlist and went to the one and only drive thru in Lusaka (KFC) for lunch. We are so excited for camp to start on Monday and would love for y’all to continue to partner with us in prayer for the week and the kids that will be attending!